First published in 1995. In the current, increasingly global economy, investors require quick access to a wide range of financial and investment-related statistics to assist them in better understanding the macroeconomic environment in which their investments will operate. The International Financial Statistics Locator eliminates the need to search though a number of sources to identify those that contain much of this statistical information. 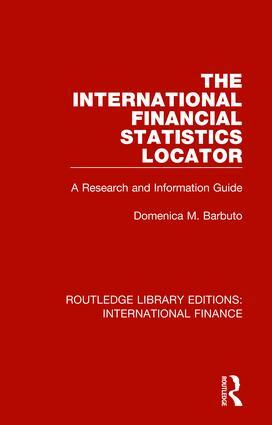 It is intended for use by librarians, students, individual investors, and the business community and provides access to twenty-two resources, print and electronic, that contain current and historical financial and economic statistics investors need to appreciate and profit from evolving and established international markets. The 4 volumes in this set, originally published between 1973 and 1998, draw together research by leading academics in the area of international finance and provides an examination of related key issues. The volumes examine international trade, principles of international finance, and one of the texts provides a comprehensive research and information guide to international financial statistics. This set will be of particular interest to students of economics and finance.